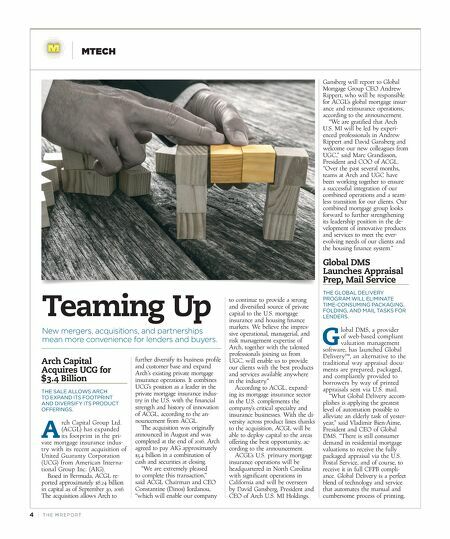 4 | TH E M R EP O RT MTECH Arch Capital Acquires UCG for $3.4 Billion THE SALE ALLOWS ARCH TO EXPAND ITS FOOTPRINT AND DIVERSIFY ITS PRODUCT OFFERINGS. A rch Capital Group Ltd. (ACGL) has expanded its footprint in the pri- vate mortgage insurance indus- try with its recent acquisition of United Guaranty Corporation (UCG) from American Interna- tional Group Inc. (AIG). Based in Bermuda, ACGL re- ported approximately $8.24 billion in capital as of September 30, 2016. The acquisition allows Arch to further diversify its business profile and customer base and expand Arch's existing private mortgage insurance operations. It combines UCG's position as a leader in the private mortgage insurance indus- try in the U.S. with the financial strength and history of innovation of ACGL, according to the an- nouncement from ACGL. The acquisition was originally announced in August and was completed at the end of 2016. Arch agreed to pay AIG approximately $3.4 billion in a combination of cash and securities at closing. "We are extremely pleased to complete this transaction," said ACGL Chairman and CEO Constantine (Dinos) Iordanou, "which will enable our company to continue to provide a strong and diversified source of private capital to the U.S. mortgage insurance and housing finance markets. We believe the impres - sive operational, managerial, and risk management expertise of Arch, together with the talented professionals joining us from UGC, will enable us to provide our clients with the best products and services available anywhere in the industry." According to ACGL, expand - ing its mortgage insurance sector in the U.S. complements the company's critical specialty and insurance businesses. With the di - versity across product lines thanks to the acquisition, ACGL will be able to deploy capital to the areas offering the best opportunity, ac - cording to the announcement. ACGL's U.S. primary mortgage insurance operations will be headquartered in North Carolina with significant operations in California and will be overseen by David Gansberg, President and CEO of Arch U.S. MI Holdings. Gansberg will report to Global Mortgage Group CEO Andrew Rippert, who will be responsible for ACGL's global mortgage insur - ance and reinsurance operations, according to the announcement. "We are gratified that Arch U.S. MI will be led by experi - enced professionals in Andrew Rippert and David Gansberg and welcome our new colleagues from UGC," said Marc Grandisson, President and COO of ACGL. "Over the past several months, teams at Arch and UGC have been working together to ensure a successful integration of our combined operations and a seam - less transition for our clients. Our combined mortgage group looks forward to further strengthening its leadership position in the de - velopment of innovative products and services to meet the ever- evolving needs of our clients and the housing finance system." Global DMS Launches Appraisal Prep, Mail Service THE GLOBAL DELIVERY PROGRAM WILL ELIMINATE TIME-CONSUMING PACKAGING, FOLDING, AND MAIL TASKS FOR LENDERS. G lobal DMS, a provider of web-based compliant valuation management software, has launched Global Delivery™, an alternative to the traditional way appraisal docu - ments are prepared, packaged, and compliantly provided to borrowers by way of printed appraisals sent via U.S. mail. "What Global Delivery accom - plishes is applying the greatest level of automation possible to alleviate an elderly task of yester- year," said Vladimir Bien-Aime, President and CEO of Global DMS. "There is still consumer demand in residential mortgage valuations to receive the fully packaged appraisal via the U.S. Postal Service, and of course, to receive it in full CFPB compli - ance. 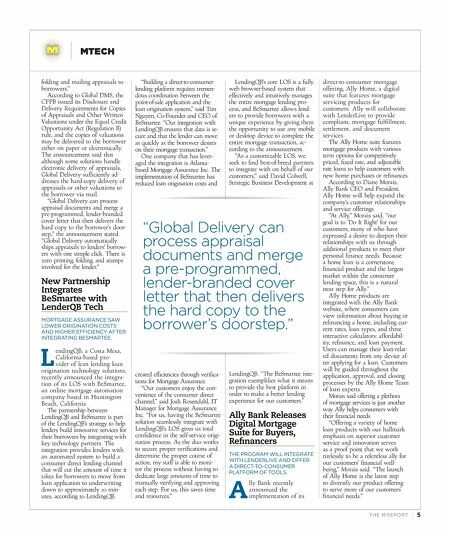 Global Delivery is a perfect blend of technology and service that automates the manual and cumbersome process of printing, Teaming Up New mergers, acquisitions, and partnerships mean more convenience for lenders and buyers.